NEC Interim President Thomas Novak says, “An integral part of NEC for more than four decades, Larry is one of the foremost cello pedagogues of our time, following in the footsteps of his teacher, Gregor Piatigorsky, in creating a lasting legacy of hundreds of students. Admission is free, but subject to the Conservatory’s new policy requiring email reservations, motivated, reputable sources tell us, by the marketing department’s interest in doing targeted advertising. No immediate plan to begin charging for free concerts seems to lurk in the offing. Click for tix HERE. Lesser’s conversation with BMInt begins after the break. FLE: You talk about striving to be informed and expecting your students to. Does that mean you remain a student all your life as well? LESSER: I can’t escape. I started to play the cello when I was six. In fact, I was given a cello by my parents on my sixth birthday. And when I turned 76, I don’t know why, but I said to people, I’ve been playing the cello for 70 years and I still can’t play in tune…but I’m still trying. Of course, nobody plays every note in tune always. And you think about comparing it to baseball, where Ted Williams was the best. He hit .406 one season and no other player has ever done that. Can you imagine a string player only in tune 4 out of every 10 notes? It would be no career, no reason to go on, but you meant in a broader sense, too. You mean being a lifelong student. Yes, of course. I’m always open to learning, and I know that I’ll never change. And I will always welcome knowing something that I didn’t know about. And you don’t fight contradictory attitudes? Yes, against stupidity, even the gods fight in vain. And we sometimes look back on our own notions from 20 years earlier and wonder what we were thinking. Well, I can give you an example. In a lot of music as early as Haydn, you find a note above which is something that looks like an upside down V. And when I was a kid, I always thought, well, that meant a very heavy accent. And I’m wrong. And I didn’t know I was wrong until about five years ago. It doesn’t mean that. What it means is that note is important, and so you should hold it, give it length, or do something to make it stand out. But what about the fermata? Take the dot away from the fermata and squeeze the sides… it’s related to a fermata, but it’s not just in terms of time. The person who really made me think about that was Nick Kitchen, who was very, very inquisitive about markings. And that came about because in the late ’90s I used to go to the Banff Center for the Arts and living there was a very important violin figure of the 20th century named Zoltán Székely, the first violinist of the original Hungarian String Quartet. He was the person for whom Bartók wrote the Second Violin Concerto. All of the string quartets were dedicated to the Hungarian Quartet, except for Number 6. Anyway, he lived his last years in the Banff Center, where he had earlier been a teacher. He retired there and lived until his late 90s. I’d always go in June and coach chamber music. One year a very young Borromeo Quartet came up there, and he coached them on Bartók. Nick told me about Claude Kenneson’s biography of Székely in which that came up. What does that mark mean? In the Fourth String Quartet, there are a lot of times there’s that mark. And Székely said he thought it meant what I said it is, and he always wanted to ask Bartók about that, but the occasion never occurred. Does that mean that Bartók never wrote a fermata? He wrote fermatas, too. But there are all kinds of different markings. Elgar, Dvořák, Schumann used that marking, and if you read it as an accent, it’s wrong. But if you read it the way I said, suddenly the eyes open wide. That’s right. That’s what he meant. But that came only later. Might you learn something from one of your students today, or from one of your interviewers? Now, let’s follow up on the tuning issue, because that brings up something that’s related to this concert in Schelomo. Aren’t there are some quarter-tones? There’s only one place. And there’s a misunderstanding, I think, about why he wrote it, because composers’ notations change over time. The way he writes it is D flat followed by C sharp and the words “+1/4 di tuono”. If you’re a real purist, you could say that the first note is lower and the second note is higher but I don’t do that, because I don’t think he intended it that way. And you can listen to a recording of Zara Nelsova playing it with him conducting, and she doesn’t do that. So was it something of a blues note? It’s a Jewish piece. He was looking for a kvetch. But you also asked about intonation. And the fact of the matter is that there is no one correct kind of intonation. Keyboards, of course, have gone through all of that. Organs have gone through all of that. And what do you believe? But this is an expressive thing, where he’s writing an outspokenly Jewish piece. OK? And so sometimes, if you’re listening to good cantorial singing, they will widen an augmented second and squeeze a half step, which you wouldn’t want to do in Beethoven. So the style of the piece demands a certain attitude toward intonation. Casals had something he called expressive intonation. But that was for tonal reasons. He said, when you’re playing solo, you can do it when a piano is not playing. For instance, if you play a G major scale, the leading tone is F sharp. And he believed the F sharp should be extra high, pushing into the G. Or if you plan an F in d minor, you should play it lower to show the minor mode. Regardless of the musical content at the moment? Well, he made a generalization. And that is known among string players as expressive intonation. But sometimes that term is used as an excuse by a performer or a snark by a critic. I’m not interested in people who use it as an excuse. They can do that if they want. Because the other marvelous thing about a quartet, without a piano, of course, is that you can have any interval perfect. You can have perfect thirds, perfect fifths, and when a quartet does that without vibrato, it’s just an uncanny effect. I’m going to tell you something now, so that you can say that you’ve learned something. I came to NEC in 1974 when Gunther Schuller was president. Either by the time I came, or shortly thereafter, he invited Rudolf Kolisch (who had the famous quartet carrying his name) to teach at NEC. He believed that string quartets should always play tempered intonation. As if they were playing with a piano. Because, well, he had his reasons. And a lot of quartets as a practical matter will do that a lot, unless there is a melody where there is a real expressive content that, where the harmony requires them to underline certain intervals. So in the Schelomo, there are, according to one of my spies, some very complicated polyrhythms, and there’s a danger that the section players will follow the soloist instead of maintaining their own rhythm. Is that something that we’re going to be aware of? And will it sound like ensemble issues? No, because we have a good conductor. There are several places like that in the piece, but that’s our problem . . .
Well, we’re used to hearing that in Brahms. Yes. Four against three. Sure. And if that’s not the reason that the piece is not done very often, why is it so rare on the concert stage? Certain pieces are established as the ones that an average audience would want to hear among cello concertos. Dvořák is the prime example. Or the Tchaikovsky Violin Concerto, or the Rococo Variations. And there was a time, I think, when Schelomo was on that short list. And it isn’t anymore. I was working with Hugh the other day in preparing, and he said that not long ago he recorded it with Steven Isserlis. And the wonderful Argentinian-Swiss cellist Sol Gabetta just recorded it. Two, the historic performances are interesting: Nelsova’s, because Bloch was conducting, and perhaps the greatest performance is Piatigorsky’s with the Boston Symphony. Just nothing comes near it. And did it sound Jewish enough? Well, he was. It sounds so personal. It sounds so very emotional. All cello music is emotional. It’s among the most emotional of instruments. I’m not going to argue with you. Does that mean the Bach suites are emotional? Does that mean that the Bach French Suites on the piano are not emotional? Depends on who’s playing, of course. Well, it depends on who’s playing the cello. But it seems like romantic souls take to the cello. Well, everybody talks about the cello as most like the human voice. I don’t mind that! Let’s get back to your being honored on your 80th. You presumably chose this piece among all the possibilities. Was there some back and forth involved about it? No, I said I would like to do it. And has it been many years since you’ve played it? Yes, I haven’t played it in a long time. And is Schelomo honoring you, or are you honoring it? I think I’m being honored. The event is a gift to me. But why this this piece for your 80th and not one of the more conventional choices? I’m Jewish. And it’s a piece that I was aware of from a very early age. I studied for a few years during my Harvard years with Leonard Rose, who made a beautiful recording of it, by the way. And that was the sound of it that I heard, and it was, it spoke to me. Schelomo, like Don Quixote, is about a man going through certain stages of life, and it always ends with death. When you turn 80, you’re aware that that’s part of the agenda. So I like the idea of doing the piece, because it’s also not necessarily a young man’s piece. It reflects life. It reflects, I won’t say, wisdom, as I think anybody who talks about his own wisdom is a fool. But it does evoke life’s experiences, ups and downs, struggle, striving, and ultimately accepting the inevitable. And thus for me, Schelomo is a perfect vehicle. And I can play it at my age. And I hope to do it well and do it justice. And if you asked me to play a Paganini Caprice or something like that, I’d say, well, you won’t hear me doing that. You won’t hear me doing showpieces that I did when I was very young. So you are a different cellist than you were in previous decades. That’s not surprising. But are there things that you do better now than you did when you were 20, 30, 40? I’ll never be done with Bach. Every time I play him, there’s always something else that I am looking for or striving for. But are there things that you wouldn’t have done early on that you feel warmer to now, things that you wouldn’t have played when you were 20 that you have more respect for now? I think it might be the other way around. I was a very open young man. And I think there are some things now that I won’t play. Piatigorsky used to say there are two kinds of music, not good and bad, which is another story, but music that is better than you, which you are never done with. Beethoven sonatas, Bach or whatever, because no matter how well you play it, you don’t think you really figured it all out. And you keep evolving. And I love playing that kind of music, and I keep on changing. Another kind of music that he said needs you. Which means if you do a good performance of that piece, people will ask, why don’t more people play that piece? There’s a wonderful violin sonata by Saint-Saëns, and the last movement is a moto perpetuo. Jascha Heifetz recorded it twice. And I grew up with those recordings, thinking, this is such a great piece. Why doesn’t anybody play it? And then you hear somebody else play it, and you understand it’s not that great a piece, but he made it great. But you’re not talking about serious pieces versus frivolous pieces. You’re talking about serious pieces that have less weight than others. Well, I don’t need to play the Rococo Variations anymore. And I played it a lot in my life. I studied it with Leonard Rose during my Harvard years, and he got me very irritated by saying, you know, Larry, this piece is not very hard. Once you learn how to do it, you’ve got it. And I was sweating bullets trying just to play the piece, but he was right. You just learn the patterns. You try to be fresh in a performance on it, but there are no mysteries left about the piece. OK but here’s a serious mystery. I heard a romantic saxophonist do it a few years back…can I book you now to do a mysterious, serious Winterreise in a couple of years? We need to talk about your Hollywood period, And by the way, Tod Machover, the subject of an upcoming interview, is about to debut an opera about that for BLO. I owe a lot to my upbringing in Los Angeles, a very rich community of great musicians thanks to Adolf Hitler. I was born in 1938. As a young player, I became aware of what was around me by let’s say 1948. And in that period before television really became strong, Los Angeles had seven or eight year-round contract symphony orchestras: the Los Angeles Philharmonic, MGM, Paramount, 20th Century Fox, Warner Brothers, United Artists, and some others. You had the Hollywood String Quartet, which was Felix Slatkin, who was concertmaster at MGM, and his wife, Eleanor Aller, who was principal cellist at Warner Brothers. My teacher, when I was a little boy, was Eleanor Aller’s father. I used to go to his apartment, and when I was there, there were these two little boys wandering around, toddlers. One of them was Leonard Slatkin, and his brother, Freddie, who became a cellist. That’s the community in which I grew up. How early did you realize what it meant for those people to be there? It meant everything for them to be there. I can tell you a sideways story, a very quick one. The main source of news in the 1940s was the newspaper. And during the Second World War, which was my first awareness of such a thing as a newspaper, and of words and writing and all of that, every day the newspaper carried a war-related headline: Battle of the Bulge, Americans Land on Sicily. Everything was about the War. And then the war ended in 1945, and I remember saying to my father, I said, Dad, are there still going to be newspapers? And he said, what do you mean? I said, well, the war is over. Sure, I was aware of it. Hollywood’s musical culture was incredible with so many composers from Germany. Dorothy Lamb Crawford wrote two books. I gave her the title for each of them. The first was about the Monday Evening Concerts out there, which started in the 1930s by a man named Peter Yates on his roof garden. And then it moved indoors and then became a very distinguished series that I played on a lot in the 1960s. That book is, “Music On and Off the Roof.” And the other one, “A Windfall of Musicians: Hitler’s Émigrés and Exiles in Southern California” was my title. Hollywood was giving them an income, and they learned by playing in the movies. And it’s all because in 1927, sound movies began, creating a huge demand for composers and players, and then there was the Holocaust. But you’re a little bit wrong about that. Because there was more through-composed music written for silent films years earlier than later for sound films. They had to write music for an entire film in the silent era. No serious film that was improvised. All the big cities presented silent films with an orchestra playing from the score of some emigres like Hugo Riesenfeld. Hollywood being a business, they learned that they could add sound scores as an artistic component to complement the emotionality or to highlight the dialogue. Suddenly they found that symphonic music was what they wanted to use. And so there were all of these musicians looking for jobs. And so many of them came to Los Angeles. All of the above. Michael Tilson Thomas’s grandfather was Boris Thomashefsky in the Yiddish Theater in New York, and his parents came to work in Hollywood. I knew Michael, my New York debut was with Michael playing the piano in Town Hall in 1967. And he was not quite yet a conductor. But his parents were both in the profession, scriptwriting or administration or whatever. Hollywood had lots of music jobs, and that’s why Michael grew up in Los Angeles. It’s a very fertile topic, and it’s important in my life. Later on, when I came back, and I had to earn a living, somebody said, well, you should hire Larry Lesser. He’s a good cellist. I got a lot of work. Yes, session work. And I remember playing a few sessions for “Rosemary’s Baby,” and Polanski was sitting there. I got to watch people, these great wind players who played five or six instruments, and earned so much money, because every doubling was an additional percentage to their salary. Or Ella Fitzgerald’s husband Ray Brown, a great bass player. I just loved watching these people. They were so good at what they were doing. The cello had just a long held note. For the string players, mostly, except for maybe Toscha Seidel and people like that, who were the concertmaster playing the very romantic, Eastern European, Russian sounding tunes, it was kind of boring. And your life felt kind of empty. And then you started teaching, or you volunteered to play in chamber music programs. That made Los Angeles into an enormously vibrant rich community. And Stravinsky and Schoenberg were there in those Monday Evening Concerts. I played, one of the last pieces he wrote, a Requiem Canticles for a chamber orchestra and singers and, I think, percussion. And there were three first performances: Princeton and Los Angeles among them, because the director, Laurence Morton of the Monday Evening Concerts, was a good friend of Stravinsky. Whenever he had smaller kinds of pieces, he would give them to the First Monday Concerts. What a pity that this German Jewish establishment doesn’t exist anymore. When I was a kid, most successful string players were Eastern European Jews. Now, there are almost none. They’re all from mainland China or Korea, or not exclusively, but I looked at the Isaac Stern competition list the other day on the Violin Channel, the finalists, out of something like 16 or 18 names, only three of them were, you would say for sure, not Asian. Only three. Do we amend Vladimir Horowitz’s famous dictum to say that there are four kinds of pianists: Jewish pianists, Asian pianists, homosexual pianists, and bad pianists? Twenty years ago, when I asked you why the Asian players are now playing with so much more emotion and feeling than they had 20 years before, you said, you just have to tell them that it’s OK, because they feel it, but they have to be told it’s OK to express it. Well, I don’t remember saying that, but that will do. How did your performing and teaching careers survive your very successful stints as NEC President? Nobody has figured out an answer to the 24-hour day. At least on Earth. And I would say that in the close to 15 years that I was president, I never stopped playing, and I never stopped teaching. But I didn’t have time to learn new repertoire. That was the tradeoff. You can’t do everything. You make choices. I have never completely caught up with that, because that was a very important period of my life, my middle years. So there are some pieces I know I won’t play, but I wish I had. The Dutillieux cello concerto, both Shostakovich concertos I never performed. I did play the Prokofiev Symphony-Concerto, and I did play Schoenberg’s Concerto, which was partly based on a piece Georg Matthias Monn wrote for Pablo Casals, who never played it. And I was the first person to record it, a recording with Columbia Symphony with Bob Craft conducting it. So I did my fair share, but I think we have a lot of other pieces I would like to have done or would still like to do: Mendelssohn wrote two wonderful sonatas, and there’s the Variations and the Song without Words. I did them all except the first sonata in B-flat major. Maybe I’ll get to it. But it was the less interesting one of the two. And I didn’t have time to do it. Let’s finish with First Monday. Are you playing much in your 34th season? I’m playing twice this year (November 5th is the next date). It’s not my performance vehicle. Though I try to play every year, often it’s just once. If I play more than twice, it’s only because somebody fell ill, and I had to jump in. But it’s not my design. I’m called the artistic director, but I more accurately probably should be known as the curator, because I’m taking ideas from lots of people and trying to put them together into some interesting form. This current season is all planned; I think it’s going to be wonderful. It’s called “A World of Cultures.” There are six concerts, as always, and each one is based upon the culture of a different country, American, Czech, Italian, Chinese, Hungarian and Polish. No German, no Austrian, no French, no Russian, no English. At all. The composers are all from the countries I named. And so on the second program, I’m playing with Miriam Fried and Sasha Korsantia. We’re doing the Smetana Trio. A very wonderful piece. The program is ending with the Parker Quartet and Kim Kashkashian doing the Dvořák American Opus 97 string quintet. And the middle piece is the Janacek Concertino, which is almost a miniature piano concerto, with David Deveau playing, with three string players and three wind players. And it’s only about 18 or 20 minutes long. And one movement is devoted to a “grumpy hedgehog”. And another movement is a “fidgety squirrel.”And so the clarinetist plays mostly E-flat clarinet. And the French horn in it plays the same three- or four- note figure over and over again like a stuck record. And it’s a wonderful very late piece of Janacek. So I’ve got the three very, very important Czech names. And the only other piece I’m playing is on the Chinese program, Snow in June by Tan Dun, that I have played over the last 25 years. It’s for cello and four percussion players, who have a big battery of percussion. Snow in June is a famous 12th-century Chinese opera with a very complex story of a woman is accused of and convicted of murdering her husband. She professes her innocence, and says that if she is executed, the gods will cause it to snow in June. You don’t talk about this piece in China, because Tan Dun wrote it a year and a half after the Tiananmen Square massacre, which was in June, and it’s a protest piece. But it’s also very touching. Last words to your students? But can they choose to do to that in lessons? Or do you expect the conservatory to do it? Obviously, I’m not going to spend an hour talking about Schopenhauer. Well, I do like to talk. This year, Lesser begins his 45th year on the cello faculty at New England Conservatory, after his appointment to the school by then president Gunther Schuller. With more than 300 cello students over the course of his career, Lesser has taught generations of musicians who have become soloists, orchestra section leaders and members, and chamber musicians who teach and perform around the world. He also served an extended tenure as President of NEC from 1983-1996, during which time he continued teaching cello students. He has curated the “First Mondays at Jordan Hall” series which is going on 34 years, and maintained an illustrious career as a performer and teacher. A high point during his tenure as President was the complete restoration of the 1,000-seat Jordan Hall, one of the world’s greatest acoustical spaces. As a chamber musician he has participated at the Casals, Marlboro, Spoleto, Ravinia, Music@Menlo, and Santa Fe festivals. He has also been a member of juries for numerous international competitions, including chairing the Tchaikovsky Competition in Moscow in 1994. A 1961 graduate of Harvard College, where he studied mathematics, Lesser went to Köln, Germany the following year to work with Gaspar Cassadó. Just before his study with Cassadó, he played at the Zermatt master classes for Pablo Casals, who declared, “Thank God who has given you such a great talent!” He won first prize at the Cassadó Competition in Siena, Italy in 1962. When he returned to Los Angeles, he studied with Gregor Piatigorsky and soon became his teaching assistant and regular faculty member at the University of Southern California. During the remainder of the 60’s he was a frequent contributor to the artistic life of Los Angeles. 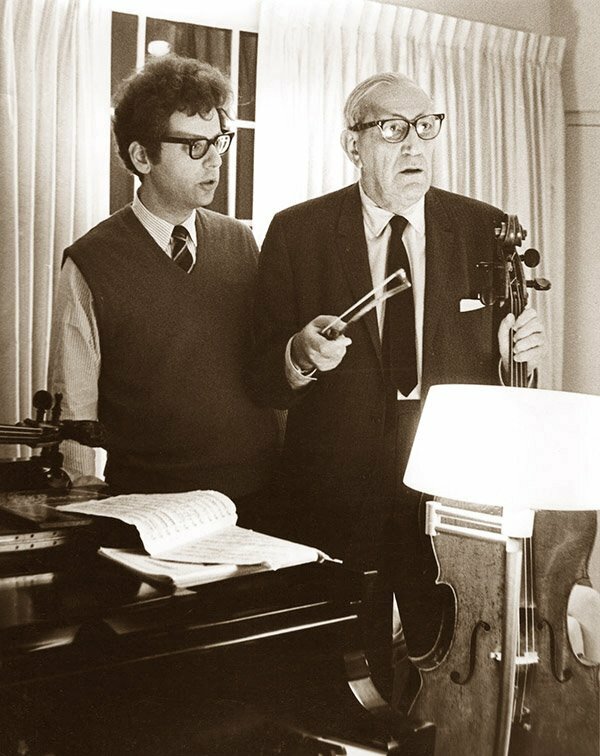 His performance of the Schoenberg Cello Concerto to inaugurate the Bing Auditorium at the Los Angeles County Museum of Art in 1965 was its first hearing with orchestra after Emanuel Feuermann introduced the work in the late 1930’s. He recorded it the following year for Columbia Masterworks. 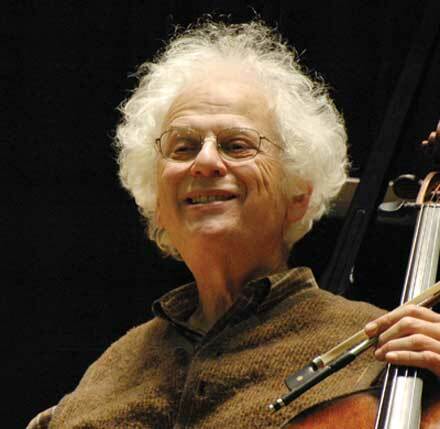 He left Los Angeles in 1970 to become Professor of Cello at Baltimore’s Peabody Institute. Lesser was invited in 1974 by then President Gunther Schuller to join New England Conservatory’s cello faculty. In 1983 he was named the school’s President, a position from which he retired in 1996 to return to performing and full-time teaching. The restoration of the 1000-seat Jordan Hall marked a high point of his tenure as President. Teaching has always been an important part of Lesser’s artistic activity. His former students, numbering in the hundreds, are soloists, orchestra section leaders and members, chamber musicians and teachers, active throughout the world. In 2005 Lesser was named “Chevalier du Violoncelle” by the Eva Janzer Memorial Cello Center at Indiana University. His recordings include Beethoven’s Complete Music for Cello and Piano with pianist HaeSun Paik on Bridge Records and a recording of J.S. Bach’s Cello Suites which includes Lesser’s new edition of the Fifth Cello Suite. The new edition combines Anna Magdalena Bach’s copy of her husband’s manuscript of the suite (now lost) with the composer’s manuscript of his arrangement of the suite for lute. Other labels he has recorded for include RCA, Columbia, Melodiya, and CRI. He plays a 1622 cello made by the brothers Amati in Cremona, Italy.